Prayer is a way to be reminded that we are loved and not alone, no matter what we are going through. “Prayers to Go” volunteers greet persons in the hospital as they walk by with a welcoming presence. When persons see the sign, they stop and ask for a prayer, and are on their way in less than a minute. Anyone can ask for a prayer, regardless of faith background. It is greatly appreciated. 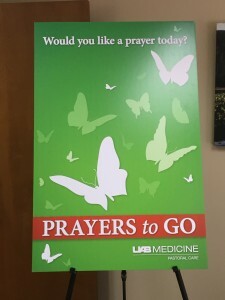 If you cannot wait or make it to a Prayers on the Go location, you may email your prayer request to chaplains@uab.edu with “Prayer Request” in the subject line, and you will receive an email within 24 hours from one of our chaplains with a prayer written for your need. All Prayers By Email will be held in confidence.